Though I notice that despite the ELH leShay having both Improved Critical and the keen enchantment on his weapons (no, they don't stack in his Attacks stats), you didn't give them anything crit-related. That's the Gloom's stick. And hey, most epic monsters have improved critical and keen on their weapons. There's just so much combat-worthy feats you can pick when you have 30+ HD. Ups, that was messy. Cleaned it up. He also has two swords at his belt. But heh, what the heck, sounds good, I'll do it. To qualify to become a Wendigo, a character must fulfill all the following criteria. Race: Animal, giant, humanoid, magical beast, or monstrous humanoid. Special: Must have their Wisdom reduced to 0 by Wendigo's hunger, OR perform a special ritual that demands they spend three days walking through a forest or tundra without stopping, resting, eating, or drinking. Skills: 2+Intelligence modifier per level, class skills are Balance, Bluff, Hide, Intimidate, Listen, Knowledge (nature), Move Silently, Search, Sense Motive, Spot, Survival. Proficiencies: The Wendigo becomes proficient with its natural bite attack. Stumped Body:Maddening Whispers: 1/day per HD, as a standard action, the Wendigo may whisper insane thoughts into a target creature within 10 feet per HD. Only the target creature can hear them, and they must make a Will save (DC 10+1/2 HD+Cha modifier) or take 1d3 wisdom damage. This wisdom damage increases one die size for every 4 HD of the Wendigo. At 8 HD it becomes Wisdom Drain. At 12 HD it deals half Wisdom Drain even if the victim suceeds on the save. At 16 HD it can affect creatures immune to ability drain, but it deals half drain on a failed save and no drain on a successful save. This is not a fear ability, and may ignore any immunity to mind-affecting attacks, with the exception of mindless creatures, which are still immune to this effect. Stalking Paranoia: Just because others can't see a Wendigo doesn't mean it isn't there. As a swift action the Wendigo may select a creature in his field of vision that hasn't detected the Wendigo. That creature takes -2 on any roll or modifier based on its wisdom, as the Wendigo lurks just at the corner of the victim's field of vision, making them paranoid. This penalty lasts until the target detects the Wendigo or the Wendigo loses sight of the target. This may only target one creature at a time. For every 5 HD the Wendigo has, this penalty increases by an extra -1. Primal Instincts: The Wendigo's hunting senses are sharpened to the extreme. It gains a bonus on Hide, Move Silently and Survival checks equal to half its HD. Sky Walk: At 2nd level, the Wendigo can use Wind Walk as a spell-like ability on itself 1/day for every HD it has, as a move action. It can still use its Maddening Whispers ability while incorporeal. It can only float above the ground unless it has 4 or more HD. Regeneration: At 2nd level the Wendigo gains regeneration equal to half his HD, bypassed by fire. However, it cannot regrow or re-attach lost limbs. Wendigo Hunger: At 2nd level, creatures bitten by the Wendigo must make a Fortitude (DC 10+1/2 HD+Con modifier) save or contract a supernatural disease, Wendigo's Hunger. Wendigo's Hunger: It incubates for 1d3 days and deals 1d3 Wisdom damage for each day it lingers. Every time Wisdom damage is taken from this, the afflicted creature must make a Will save with DC 10+1/2HD+Cha modifier or start to hunger for its own race's flesh. The creature will use any means at it's disposal to stalk and kill a member of his own race in secret, feed on it's flesh, and then return to his normal life while forgeting everything since he failed the Will save. Creatures reduced to 0 Wis by this disease gain the Wendigo template, but they also become mad and race to the wilderness to stalk their own victims. In addition, when a living or undead creature is bitten by the Wendigo in battle, it must make a will save with DC 10+1/2HD+Cha mod or spend it's next turn trying to bite the nearest creature it can see, be it friend or foe. If the creature doesn't have a bite attack it will try to grapple the neatest creature instead. Ravenous Bite: At 2nd level the Wendigo's bite now threatens a critical on a 18-20 and deals triple damage on a successful critical. Ability Score Increase: The Wendigo gains +1 Dex at second level. The Wendigo is the dark side of natural hunger, a creature that stalks his own and forever roams searching his next victim, driving them to the brink of desesperation before delivering the final blow. First level gives the iconic maddening whispers and stumped body plus skill bonus. Second level gives the wind walk, disease and regeneration. I improved the disease to make it combat-worthy by forcing biten oponents to resist or be overcome by hunger themselves. Particulary good against caster-types, not that good against big monsters with big bite attacks. Since it has a lot of abilities low saves, Bab and limited skill points and no new proefeciencies besides the bite. You can only actualy start flying at 6th level for balance purposes, but Wind-Walk flight comes online at 4th level since it's much more limited. 2 Skill points+int per level, quadruple at 1st level. Class skills: Concentration, Climb, Hide, Spot, Listen, Move Silently, Swim, Intimidate, Knowledge(any), Search, Spellcraft. 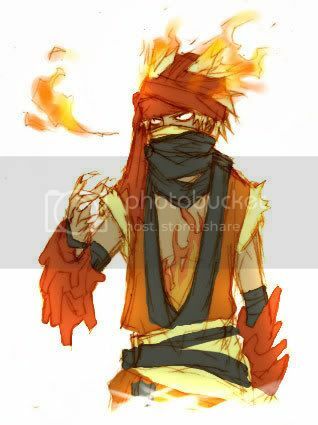 Proficiencies: a Fang Dragon isn't proficient with any armor or weapons, besides his own natural weapons. Fang Dragon Body: The Fang Dragon loses all other racial bonuses, and gains Dragon traits, bite 1d8 damage, 2 claws attack for 1d6 damage each and 40 ft. base Land Speed which increases by 10 ft per 1HD the Fang Dragon has, medium size. The Fang Dragon has wings, but they're too weak to do anything for now. His claws are capable of fine manipulation and can be used for somatic components of spellcasting or anything else a human hand could do. The Fang Dragon also gets a natural armor bonus equal to his Con modifier +2. Whenever the Fang Dragon grows one size category, his natural armor increases by a further 1. The Fang Dragon has no immunities or vulnerabilities. Draining Bite: At 2nd level a Fang Dragon does not have a breath weapon, but its bite drains Constitution if the victim fails a Fortitude save. At level two this bite drains 1d2 Constitution points, Fort save DC of 10+1/2 Dragon Level+ Con Mod negates. The Con Drain keeps increasing with HD. Ability score increase: The Fang Dragon ability scores increase by the shown amount. Keen senses: The Fang Dragon sees four times as well as a human in shadowy illumination and twice as well in normal light. It also has darkvision out to 120 feet. Trip (Ex):Arcane Blood:A fang dragon receives spells known and spells per day as a sorceror of 2/3 his level, but he has CL equal to his HD. Blindsense: At 3rd level, as the normal ability, range 60 ft.
Fang Dragon SLAs: At 3rd level the Fang dragon can use Detect Magic and Read Magic each 1/day for every HD it has. Wings: At 4th level the Fang Dragon becomes able to fly at the speed of 10 ft. per HD, with poor maneuverability. The maneuverability doesn't increase naturally, but players can take the Savage Species feat that increases it by two steps (stackable). Each wing can also be now used to deliver a natural attack dealing 1d4 damage. Enhanced Damage:At 5th level the Fang Dragon is a dangerous weapon, every part of it capable of killing you, such it is that because of how dangerous the dragon is its Natural Weapons damage scales as if it was one size larger then the dragon actually is. Sound Imitation (Ex): At 5th level a Fang dragon can mimic any voice or sound it has heard, anytime it likes. Listeners must succeed on a Will save (DC Dragons Level + Cha Modifier). Growth: At 6th level the Fang Dragon grows to Large Size. At 12th level the Fang Dragon grows to Huge Size. At 17th level the Fang Dragon grows to Gargantuan Size. Tail slap: The Fang dragon can now make a tail slap attack dealing 1d8 damage(already taking in account large size). Dispel Magic: At 8th level the Fang Dragon can use dispel magic as a SLA for every 4 HD it has. At 11 HD this ability upgrades to Greater Dispel Magic SLA. Telekinesis: At 9th level the Fang Dragon can now use Telekinesis as an SLA 1/day for every 3 HD it has, save DC 10+1/2HD+Cha mod. Arcane skin:At 10th level the Fang Dragon gains SR equal to his HD+11. Iron Scales: At 11th level the Fang dragon gains DR/magic equal to half his HD. Globe invulnerability: At 13th level, SLA as the spell, 1/day for every 4 HD. Fast Healing: As the standard ability, equal to half the Fang Dragon's HD. Spell Turning: At 15th level the Fang Dragon can now use Spell Turning as an SLA 1/Day for every 5 HD it has. Carnivore Speed: At 16th level the Fang dragon gains +10 foot to his base speed, and an extra +10 for every 2 HD gained from here. In adition, the Fang Dragon can cast one of his SLAs on himself as a swift action when performing a charge. Tail sweep:Draining Body: At 18th level select one of the Fang Dragon's natural weapons besides his bite. That weapon now deals Con Drain as his bite. Once made this choice can't be changed. Outburst1/day, the Fang dragon can go into a rage as a free action in wich it tears even more viciously than normal. It lasts for a number of turns equal to the Fang Dragon's Con modifier, and during it oponents that sucessfully save against his Draining bite/body still take half Con drain. Shred: At 20th level the fang dragon now ignores immunity to energy drain. If attacking an oponent whitout Con score it deals Cha drain instead. The Fang Dragon is a more vicious version, growing faster and trading his breath weapon for improved melee capacity. It hits pretty hard in melee and has powerfull abjuration SLAs to get close to pesky spellcasters. If you want to play a more savage dragon that tears apart his oponents with his limbs, the Fang Dragon's for you. Skills: The Successful Half-Golem Gains (4+Intelligence Modifier) skills per level. The Successful Half-golem class skills (and key ability for each skill) are Bluff (Cha), Climb (Str), Craft(any) (Int), Diplomacy (Cha), Handle animal (Wis), Hide (Dex), Jump (Str), Knowledge (any) (Int), Listen (Wis), Move silently (Dex), Profession (any), Spot (Wis), Survival (Wis), Swim (Str), Use Magic Device (Cha). Skills: The Failed Half-Golem Gains (2+Intelligence Modifier) skills per level. The Failed Half-golem has no in class skills. Proficiencies: The Half-Golem is proficient with any natural weapons it may gain from this class, however it does not gain any new armor proficiencies. Half Adamantine Golems|Do not Heal from Magic. Half Alchemical Golems |Heal from Acid damage. Half Amorphion Golems|Heal from Acid damage. Half Ash Golems |Heal from Fire damage. Half Assembly Golems |Heal from Electricity damage. Half Battleglory Golems|Heal from Cold damage. Half Birthday-Cake Golems|Heal from Fire damage. Half Blood of War Golems|Heal from Repair/Cure* spells. Half Brain Golems|Heal from Electricity damage. Half Brass Golems|Heal from Fire damage. Half Butterscotch-Pudding Golems |Heal from Acid damage. Half Cadaver-Collector Golems|Heal from Electricity damage. Half Caltrop Golems|Heal from Fire damage. Half Calzone Golems|Heal from Fire damage. Half Carver Golems| Heal from Fire damage. Half Chain Golems|Heal from Fire damage. Half Chocolate Golems|Heal from Cold damage. Half Clay Golems|Heal from Acid damage. Half Coral Golems|Heal from Electricity damage. Half Demon-Flesh Golems|Heal from Electricity damage. Half Fang Golems|Heal from Cold damage. Half Flesh Golems|Heal from Electricity damage. Half Force Golems|Heal from sonic damage. Half Gear Golems|Heal from Electricity damage. Half Gloom Golems|Heal from negative energy damage. Half Grave-dirt Golems|Heal from Electricity damage. Half Hangman Golems|Heal from Cold damage. Half Hellfire Golems|Heal from Fire damage. Half Homunculus Golems|Heal from Repair/Cure* spells. Half Ice Golems|Heal from Cold damage. Half Inevitable Golems|Heal from Electricity damage. Half Inquisition Golems|Heal from Fire damage. Half Iron Golems|Heal from Fire damage. Half Juggernaut Golems|Heal from Cold damage. Half Junk Golems|Heal from Acid damage. Half Magmacore Golems|Heal from Fire damage. Half Mindstrike Golems|Heal from Acid damage. Half Mud Golems|Heal from Cold damage. Half Nimblewright Golems|Heal from Electricity damage. Half Outer Golems|Heal from Acid damage. Half Peanut Butter Golems|Heal from Fire damage. Half Perfector Golems|Heal from FireCold damage. Half Plague Golems|Heal from Acid damage. Half Replicant Golems|Heal from Cold damage. Half Rubber-Chicken Golems|Heal from Fire damage. Half Sand Golems|Heal from Fire damage. Half Sentinel of Mithardir Golems|Heal from Electricity damage. Half Shacklelock Golems|Heal from Fire damage. Half Shadesteel Golems|Heal from negative energy damage. Half Shield-Guardian Golems|Heal from Fire damage. Half Siege Golems|Heal from Cold damage. Half Split-Rail Golems|Heal from Cold damage. Half Stained-glass Golems|Heal from sonic damage. Half Stone Golems|Heal from Cold damage. Half Tangled Seasonal Lights Golems|Heal from Electricity damage. Half Tombstone Golems|Heal from Cold damage. Half Trainer Golems|Heal from sonic damage. Half Valorhammer Golems|Heal from Cold damage. Half Warforged Golems|Heal Repair/Cure* spells. Half Web Golems|Heal from Acid damage. Half Woodwrath Golems|Heal from Cold damage. Half Worker Golems|Heal from Fire damage. *Repair/Cure: Successful Half-Golems that pass The DangerThe DangerHaste Effects heal a Half Mithral Golem 1d8 Hp per Caster Level. ^^ Any Light Based spell that deals damage heals the Half Skywatcher Golem, any Light spell that does not deal damage heals the Half Skywatcher Golem 1d4 hit points per Spell Level. Ability increase: The Half Golem gains a +1 bonus to Strength at levels 1,2, and 3. Regardless of the choice made, any effect that allows a save can affect even targets immune to it once the Half-golem reaches 10 HD, but they gain a +5 bonus on their saves. Golem plate:At second level the Half-golem gains DR/Adamantine equal to 1/2 its HD (or other if the construction material says otherwise). Magic Resistance: At third level the Half-golem gains Spell Resistance equal to 17+HD. It can rise or lower it as a free action even if it isn't its turn. Heavily Contributed by Chumplump from GITP. [spoiler]Adamantine-Alchemical- As a free action, 1/Minute, the Half Alchemical Golem may breathe out a cloud of poisonous gas which fills a 10 foot cone in front of the Half Alchemical Golem, plus 5 feet for every 3 HD the Half Alchemical Golem has. Any creature caught in the gas suffers 1d4 acid damage per HD the Half Alchemical Golem has, Reflex DC (10+1/2 HD+Con Mod) for half, further any creature so damaged must make a Fortitude save of the same DC or be nauseated for 1 round. At 10 HD even creatures immune to it can be affected but they gain a +5 bonus on their saves. Amorphion- The Half Amorphion golem may radiate a Wild Magic as a 5 feet per HD radius emanation, centered on the Half Amorphion Golem, any spells cast within this area are treated as being cast on a plane with a Wild Magic atmosphere. Initiating this aura or ending it is a swift action, but the Half Amorphion Golem may only maintain its Wild Magic aura for a number of rounds per day equal to twice its HD. Artillery- Prototype BodyAsh-Assembly-Battleglory-Birthday-Cake- As a free action, 1/Minute, the Half Birthday-Cake Golem can fan the flames of its candles into a deadly breath attack. This attack spreads out to a 10 foot cone in front of the Half Birthday-Cake Golem, plus 5 feet for every 3 HD it has. This cone deals 1d8 fire damage per lit candle to any creature caught within it, Reflex DC (10+1/2 HD+Con Mod) for half. Blood of War-Returning special quality. Brain-Brass- 1/day the Half Brass Golem may designate any creature it can see or smell through its scent ability as its quarry. For a duration of 1 minute per HD the Half Brass Golem has, it knows the exact location of that creature no matter what distance or obstacles are between the Half Brass Golem and the quarry, so long as the quarry is on the same plane as the Half Brass Golem. The Quarry may, as a full round action, attempt an Intelligence Check DC (10+1/2 HD+Wis Mod) in order to lose the Half Brass Golem, effectively ending this effect. The Half Brass Golem may use this ability an additional time per day for every 4 HD it possesses. Upon reaching 5 HD, the Half Brass Golem gains a +2 bonus to AC and saves against creatures other than its Quarry. Its Quarry takes a -2 penalty on all attack rolls against creatures other than the Half Brass Golem. These bonuses and penalties are negated if the Half Brass Golem attacks another creature besides its Quarry, but this does not end the Quarry effect. (It still is aware of the exact location of its Quarry no matter what distance). Upon reaching 10 HD the Half Brass Golem may instead use one its daily uses of Quarry to Cast MazeButterscotch-Pudding-Cadaver-Collector-Caltrop-Calzone-Carver-Chain- As part of a Full-Defense action the Half Chain Golem can surround itself with a whirling, slicing shield of chains, Any creature adjacent to the Half Chain Golem suffers 1d6 slashing damage per HD of the Half Chain Golem, a successful Reflex save DC (10+1/2 HD+Dex Mod) reduces this damage by half. Any creature or object entering or passing through a square adjacent to the Half Chain Golem is subjected to this damage without a saving throw. The Half Chain Golem further gains a one half cover from this ability granting it a +4 cover bonus to AC. The Half Chain Golem may not take a move action while this ability is activated. A Half Chain golem may use this ability a number rounds per day equal to twice its HD. Chocolate- Once every minute, As part of a normal slam attack, the Half Chocolate Golem may use its melty delicious nature to make a slam attack that leaves the targeted creature covered in a sticky mess, that is has a fantastic scent. If the attack is successful the targeted creature must succeed on a Will Save DC Once every minute, As part of a normal slam attack or be effected as per the SlowClay-Coral-Demon-flesh-Dragon-flesh-Fang-Fewmet- The Half Fewmet golem may radiate an aura of energy (specifically the energy it has an affinity for, See Prototype Body) as a 5 feet per HD radius emanation, centered on the Half Fewmet Golem, any creatures or objects within this area suffer 1d4 points of Elemental damage per HD. Initiating this aura or ending it is a swift action, but the Half Fewmet Golem may only maintain its Energy aura for a number of rounds per day equal to twice its HD. Flesh-Force- The Half Force Golem gains a powerful force attack, It gains one of the following Golem weapons, this decision may not be changed after it is selected at second level. [spoiler] Force Burst: As a standard action, 1/minute, the Half Force Golem may unleash a 30 feet radius blast of force centered on itself. Any creature caught in the blast suffers 1d6 force damage per 2 HD of the Half Force Golem and are knocked prone. If the opponent succeeds on a reflex save (DC 10+1/2 HD+Cha) they only suffer damage and are not knocked prone. Pulse: As a standard action, 1/minute, the Half Force Golem may launch a bolt of force at any target within 10 feet plus 5 feet per HD it has, as a ranged touch attack, if it hits, the Half Force Golem makes an opposed Strength check against the target, adding its Cha mod to the check. If The Half Force Golem succeeds, the opponent is flung 5 feet in a direction of the Half Force Golem's choice, and is knocked prone. The distance of this ability increases by 5 feet at 6 HD, and by another 5 feet every 3 HD thereafter. The Half Force Golem may also choose the fling the target straight into the air, in which case the target suffers from appropriate falling damage. If the target's movement is stopped by a wall or barrier, they suffer 1d6 damage for every 5 feet that they would have gone further. Reactive Force:Force Slam:Gear-Gloom- Once per day per 3 HD the Half Gloom Golem has, it may declare one of its slam attacks to be a Touch of Woe. If the Slam attack hits its target that target suffers 1d6 points of charisma damage. If an opponent is reduced to 0 Charisma from this attack, it drops into a night-mare filled coma and cannot be restored to consciousness without the aid of a Break Enchantment or Remove Curse effect. Creatures damaged by this Touch of Woe often behave miserable and withdrawn until their Charisma damage is restored. Grave-dirt-HallowedHangman- The Half Hangman Golem gains reach of 5 extra feet with its slam attack, as well as Improved Grab, allowing it to initiate a grapple on a successful slam attack without having to make a touch attack or provoke an attack of opportunity. On a successful grapple check, the Half Hangman Golem deals constriction damage equal to its slam damage. If it beats the opponents grapple check by 10, the opponent must succeed on a DC (10+1/2 HD+Con Mod) Fortitude save or be dazed for one round. Even on a successful save the opponent begins to suffocate until it can break free from the grapple. Hellfire-Homunculus -Ice- The Half Ice Golem, as a free action 1/minute, can spray ice shards from its body filling a 10 foot cone in front of the Half Ice Golem, plus 5 feet for every 3 HD. Any creature caught in the spray suffers 1d4 damage per HD, Reflex DC (10+1/2 HD+ Con Mod) for half. Half of this damage is piercing, the other half is cold damage, further any creature so damaged must make a Fortitude save of equal DC or be Blinded for 1d4+1 rounds. Inevitable-Inquisition- The Half Inquisition Golem gains a powerful torture attack, it gains one of the following Golem weapons, this decision may not be changed after it is selected at second level. Iron- As a free action, 1/Minute, the Half Iron Golem may breathe out a cloud of poisonous gas which fills a 10 foot cone in front of the Half Iron Golem, plus 5 feet for every 3 HD. Any creature caught in the gas is subjected to the its inhaled vector poison, with a Fortitude save DC of (10+1/2 HD+Con Mod) and an initial and secondary damage of 1d4 Con damage. This damage increases by one size category every 4 HD the Half Iron Golem has. At 10 HD even creatures immune to it can be affected but they gain a +5 bonus on their saves. Junk- As part of a Full-Defense action the Half Junk Golem can surround itself with a cloud of flying sharp debris. Any creature adjacent to it suffers 1d4 slashing damage per HD the Half Junk Golem has, Reflex save DC (10+1/2 HD+ Dex Mod) for half. Any creature or object entering or passing through a square adjacent to the Half Junk Golem is subjected to this damage without a saving throw. The Half Junk Golem may not take a move action while this ability is activated. A Half Junk Golem may use this ability a number rounds per day equal to twice its HD. If this ability is activated in an area of substantial refuse this damage increases to 1d10 slashing damage per HD of the Half Junk Golem, and the Half-Junk Golem gains fast healing equal to its HD while this power is active. Juggernaut-Magmacore- As a free action 1/minute the Half Magmacore Golem may shatter its natural armor, completely losing is bonus to natural armor from the Half-Golem class, gaining aBlurMindstrike- The Half Mindstike Golem gains an additional bite natural attack that deals 1d6 damage, and may be used to deliver a mind-addling venom. Any creature damaged by this bite is subjected to this poison, with a Fortitude save DC of (10+1/2 HD+Con Mod) with initial and secondary damage of 1d6 Cha damage. This damage increases by one size category every 4 HD the Half Iron Golem has. If an opponent is reduced to 0 Charisma from this venom, it grows irrevocably mad, as if by Insanity. At 10 HD even creatures immune to it can be affected but they gain a +5 bonus on their saves. Mud- As a free action, 1/Minute, the Half Mud Golem can belch out a massive spray of slop. This fills a 10 foot cone in front of the Half Mud Golem, plus 5 feet for every HD. Creatures within the area are sprayed with thick sticky mud, creatures in this area must make Reflex save DC (10+1/2 HD+Con Mod) or fall prone. Further this covers all affected squares with mud, as if dropped by its Construction material. Mithral- The Half Mithral Golem gains a second slam attack and may make a flurry attack with its slams, gaining an additional attack at full base attack bonus, however when using this flurry, all attacks made in the round suffer a -2 penalty. (The Half Mithral Golem should wind up with 3 slam attacks with a flurry). Nimblewright- If the Half Nimblewright Golem hits an opponent with its rapier hand attack, it may attempt to trip that opponent without needing to make a touch attack, or provoking an attack of opportunity. Further, when attacking a prone creature, it deals an additional 2d8 damage with a successful attack. [spoiler]Outer- The Half Outer Golem gains reach of 5 extra feet with its slam attack, as oozy green tentacles grow out of its body. It also gains Improved Grab, allowing it to initiate a grapple on a successful slam attack without having to make a touch attack or provoke an attack of opportunity. On a successful grapple check, the Half Outer Golem deals constriction damage equal to its slam damage. Further, 1/minute the Half Outer Golem may make a charge attack at 4 times its movement speed, as it charges it grows uncannily hot, and its slam attack deals an additional 1d6 fire damage at the end of this charge. Peanut-Butter-Perfector- The Half Perfector Golem gains a terrifying Gaze attack, any creature within a 5 feet per HD radius of the Half Perfector Golem are subjected to this Gaze attack, and must succeed on a DC (10+1/2 HD+Con Mod) or become shaken for 1d4 rounds per 2 HD. A successful save leaves that opponent immune to this fear effect for 24 hours. Further the Half Perfector Golem may use Banishment as a spell like ability 1/day per 5 HD the Half Perfector Golem has. Caster level equal to its HD. [spoiler]Contact The Half Plague Golem may touch the surface of any single object placing a contact disease over 1 square foot of its surface area per HD. Any creature touching this area within 10 minutes per HD must make a Fortitude save or suffer the ill effects of the disease. Inhaled: The Half Plague Golem may exhume foul air, which fills its own square, and spreads out in a 5 feet per 3 HD radius spread centered on the Half Plague Golem. This foul air does not inhibit vision, and hangs in the air for 1d4+1 rounds before dispersing. Any creature moving through and breathing in this foul air must make a successful Fortitude save or suffer from the ill effects of the disease. At 10 HD even creatures immune to it can be affected but they gain a +5 bonus on their saves. Prismatic- As a free action, 1/minute, the Half Prismatic Golem may extend a luminous tendril from its body in order to make a Prismatic touch attack. This attack has a random effect based on the color of the tendril that made the attack, it cannot control which tendril it uses. Roll 1d8 and consult the following list to figure out the exact effect of the attack. This attack deals 1d4 damage of the appropriate type per HD. **Confusion does no damage, but subjects the creature to a ConfusionInsanity effect, as per the spell of the same name. Rubber-Chicken- As part of an attack action, 1/minute, the Half Rubber-Chicken Golem may make a Bad Joke attack with its slam. Any creature struck this slam attack must succeed on a DC (10+1/2 HD+Cha Mod) Will save, or be effected by a Hideous Laughter effect, caster level equal to its HD. Alternatively at third level the Half Rubber-Chicken Golem may opt to, instead, gain access to the Falling Anvil discipline regardless of class. In addition, it may choose one 1st-level Strike from this discipline and use it once per encounter (as if it had picked up a strike with the Martial Study feat, although this does not count against the number of times it may select this feat). Sand-Sentinel-of-Mirhardir-Shacklelock- The Half Shacklelock Golem gains Improved Grab, allowing it to initiate a grapple on a successful slam attack without having to make a touch attack or provoke an attack of opportunity. On a successful grapple check, the it deals constriction damage equal to its slam damage. If the Half Shacklelock Golem successfully pins a creature, it may, as an immediate action, bind that creature in a pair of Masterwork Manacles, that have an Escape Artist DC equal to (10+1/2HD+Str Mod) or require 2 Open Lock checks of the same DC. (One for the feet, and one for the Hands.) The Shacklelock Golem does not need to continue grappling the creature to leave it in its manacles, and may choose to have a bit of chain of any length up to 10 feet per HD leading back to the bound creature. The Half Shacklelock Golem may have a number of creatures so bound at any given time equal to 1/2 its HD. Shadesteel- As a free action, 1/Minute, the Half Shadesteel Golem may release a wave of negative energy which emanates out in a 10 foot cone in front of the Half Shadesteel Golem, plus 5 feet for every 3 HD. Any creature caught this emanation suffers 1d4 negative energy damage per HD, Will save DC (10+1/2HD+Con Mod). Undead creatures are healed by this effect as they would be by an Inflict Wounds spell. Shield-Guardian- The Half Shield-Guardian Golem gains a transfer pain touch attack. It may make a touch attack against any two creatures adjacent to it. One of these creatures is healed 1d6 Hp per HD, the other creature and the Half Shield-Guardian Golem each suffer half this damage rounded down. A Will save from the other creature reduces this damage by half again, but not for the Shield-Guardian. Siege-Skywatcher- The Half Skywatcher Golem, as a free action, 1/minute, may release a beam of searing light. This requires a ranged touch attack and deals 1d8 damage per 2 HD, and has a range of 40 feet per HD. Undead creatures, and creatures particularly weak to sunlight, suffer 1d6 damage per HD. Undead creatures that are particularly weak to sunlight (such as vampires) suffer 1d8 damage per HD. Inanimate objects and Constructs only suffer 1d6 damage per 2 HD. Split-rail-Stained-Glass-Stone- The Half Stone Golem can cause a creeping curse in those raise their ire, as a free action 1/minute. The Half Stone Golem may select any target within a range of 10 feet plus 5 for every 3 HD beyond 5, this Target must succeed on a DC (10+1/2 HD+Con Mod) Will Save or suffer the effects of a Slow spell, Caster Level equal to its HD. Tangled-Seasonal-Lights- The Half Tangled-Seasonal-Lights Golem gains Improved Grab, allowing it to initiate a grapple on a successful slam attack without having to make a touch attack or provoke an attack of opportunity. On a successful grapple check, it deals constriction damage equal to its slam damage. Further, the Half Tangled-Seasonal-Lights Golem may use an Animate RopeAnimate RopeAnimate RopeTombstone-Trainer- As a free action, 1/Minute, the Half Trainer Golem may let out a terrible shriek that fills a 10 foot cone in front of the Half Trainer Golem, plus 5 feet for every 3 HD. Any creature caught in this area suffers 1d4 sonic damage per HD, Fortitude save DC (10+1/2HD+Con Mod) for half, further any creature so damaged must make an additional Fortitude save of the same DC or be deafened for 1d4+1 rounds. Warforged- Warforged grafts are highly adaptable, and are easily modified, the Half-Warforged Golem gains 1 upgrade selected from the Iron Golem Monster Class that it qualifies for instead of a Golem weapon. Web- The Half Web Golem may, as a standard action, 1/minute, throw a web-net, which as a net but has a range increment of 50 feet, and is effective against creatures up to one size category larger than the Half Web Golem. An entangled creature can escape with a successful Escape Artist check DC (10+1/2HD+Str Mod) or burst free with a successful Strength Check DC (10+Str Mod), both of which are standard actions, a strand of web-silk leads back the Half Web Golem. Further, there are venomous barbs in the web, any creature entangled is subjected to a numbing poison. The creature is only subjected to the poison once per entanglement. This poison has a Fortitude Save DC of (10+1/2HD+Con Mod), and deals 1d4 Dexterity damage as initial and secondary damage. This damage increases by one size category every 4 HD. At 10 HD even creatures immune to it can be affected but they gain a +5 bonus on their saves. Woodwrath-Worker- As a free action, 1/minute, the Half Worker Golem may fire a terrible tribeam cannon designed to eliminate material. This cannon strikes unerringly at a range of 10 feet per HD. The targeted creature or object suffers 1d4 damage per HD, Fortitude save DC (10+1/2HD+Con Mod) for half, further any creature or object reduced to 0 hp in this manner is disintegrated. This attack ignores hardness and deals full damage to objects. The half-golem seems quite powerful... So at level 20, it could have a +17 to one physical ability score from "Improvement"? And this is an untyped bonus? On top of the other stuff from the template? Is that intended? ChumpLump's thread for that class is still active. Friends don't let friends post on GITP. I mention this mainly because of how freaking huge it is. SiggyDevil: The MM Nightwalker correct? PhaedrusXY:Well yes. Strenght is tecnically the weakest score of all, so even if you get +17by 20th level, what's the worst that could happen? Yes indeedy. Not the variants, mind you. Just the humanoid one. I'd love to play a L1 Nightwalker no matter how weak (it could have merely a single ability: the Improved Sunder feat). It says any physical score. So let's put that +17 in Con, and give this thing a breath weapon (the other 17 levels could be in Dragon or something). This also would stack with all the other ways of inflating your Con score. So now it has its hit points, main attack DC, and armor class based on its massively inflated Con score. Seriously. +17 is too big. It's totally ridiculous, and kicks you off the random number generator that the rest of the game uses. Nothing else gives you a bonus anywhere near that big pre-epic. It may not be game-breaking in and of itself, but it is totally out of line with everything else in D&D, basically. I think it should be limited to half your character level, and be an enhancement bonus. It should also scale in the normal fashion, but maybe have some kind of discount built in, and allow you to go above +6 pre-epic. Sorry, let that slip by, was suposed to be only Str score. Corrected now. Seriously. +17 is too big. It's totally ridiculous, and kicks you off the random number generator that the rest of the game uses. Nothing else gives you a bonus anywhere near that big pre-epic. Giant size (up to +32 Str pre-epic,plus other goodies). Polymorph. Shapechange. Bite of the WereX. Str is really easy to boost. It may not be game-breaking in and of itself, but it is totally out of line with everything else in D&D, basically. I think it should be limited to half your character level, and be an enhancement bonus. It should also scale in the normal fashion, but maybe have some kind of discount built in, and allow you to go above +6 pre-epic. One of the golem's (and half-golem) main traits are their massive Str scores compared to the rest of their ability scores. I wanted to represent that, that having a golem limb makes you hit harder than the giant sized shapechanging cleric. Plus Str isn't really tied to anything meaningfull besides melee damage, besides hulking Hurler Shenigans, but that combo is already broken whitout need of help. Boosting any score yes was broken, but Str-only is perfectly manageable in my opinion. [spoiler]Adamantine-Alchemical-Amorphion Golem- This material is constantly changing, ever reshaping itself. The Half Amorphion Golem may add a +2 bonus to any one of its ability scores. It may reassign this bonus 1/day, as a standard action. Further the Half-Amorphion Golem may alter its form as per the spell Alter Self 1/day per 4 HD as a Full Round Action, caster level equal to its HD. Artillery- This material is designed for effect combat mobility, the Half Artillery Golem may slow any fall it takes to 30 feet per round, and does not take falling damage while conscious. Upon Reaching 5 HD the Half Artillery Golem may levitate as if it had cast the spell of same name upon itself for a total number of rounds per day equal to its HD+ Charisma modifier. It does not suffer the normal attack penalties for this levitating. The Artillery Golem's levitation speed is 20 feet + 5 feet for every 2 HD it has above 5. Ash- This material is loose and easily airborne, creating quite a few problems for anyone standing near the Half Ash Golem. Any time the Half Ash Golem is damaged, it fills all squares adjacent to it with thick clouds of airborne Blistering Ash, causing a -2 penalty to Dexterity and vision based skill checks, attacks rolls, and Reflex Saves to all creatures within a square of airborne ash. Further, if the creature that did the damaging is in an adjacent square to the Half-Ash Golem, it suffers 1d4 points of fire damage per 4 HD. The Half-Ash Golem may also leave clouds of Ash behind it as part of a move action, filling any square moved through by the Half Ash Golem with this same airborne Ash. This ash dissipates three rounds after forming, and can be dissipated fast by wind effects. Further when a Half Ash Golem gains Damage Reduction at third level, it gains DR/ Adamantine and Bludgeoning. Battleglory-Birthday-Cake-Heroism caster level equal to its HD. Blood of War- This material is very strong but demands constant upkeep or else it becomes a hindrance. The character's strength score improves by an extra +4 and its Natural armor increases to equal its constitution modifier, further, it can detect any creature within a 30 feet per HD range that has been injured or is actively bleeding, as if by the Scentspecial quality. The Half Blood of War Golem must consume an amount of blood equal to the water it requires each day, every day the Half Blood of War Golem does not consume such blood it must make a Fortitude save (DC 10+number of days since its Last Feeding) or grow weak. It loses 1 points of Strength each day it fails this save. It takes 1 minute of interrupted work with proper tools (cost 50 GP, not expended by this) and the body of a recently slain creature with blood (Which is consumed in this process, each creature offers a total amount of repairs equal to half its constitution score), and a successful heal, profession, or craft check the appropriate type with DC (18) to remove each point of this Strength penalty. A Restoration spell will automatically remove this Strength penalty and will prevent this Strength penalty for 24 hours. The subject can repair itself but it takes double time. There's no penalty for failing these repair checks. Brain- This material resonates with psionic energy. The Half Brain Golem gains a +2 bonus to Intelligence and gains a deflection bonus to armor class equal to its Intelligence modifier, further it gains two additional power points per HD. Brass This material greatly improves the olfactory capabilities of the Half Brass Golem. The Half Brass Golem gains the Scent ability and gains a bonus on Survival checks (Including those made in Tracking) equal to its HD, it may make survival checks in the place of intelligence checks when attempting to navigate labyrinths and mazes, including those created by the Maze spell. Further the Half Brass golem gains a +2 bonus to strength, and its bonus natural armor is increased to equal its constitution modifier. Butterscotch-Pudding- This material is extremely sticky making the subject a great walking mess. Any weapon that deals damage to a Half Butterscotch-Pudding Golem becomes stuck to its skin, unless the wielder succeeds on a DC (10+1/2HD+Str Mod) Reflex save. The weapon may be retrieved with a successful disarm check which the Half Butterscotch-Pudding Golem receives a racial bonus to equal to half its HD. A Half Butterscotch-Pudding Golem can spend a standard action to cover over a single weapon per round and hide it within its Limb, however the Half Butterscotch-Pudding Golem may only have one item hidden within its limb at any given time. This item can only be retrieved if the Half Butterscotch-Pudding Golem is unconscious and requires a Disarm check as if the Half Butterscotch-Pudding Golem is taking 10. Cadaver-Collector- This material is built with fierce steel and cruel spikes, the Half Cadaver-Collector Golem is treated as having armor spikes of a creature one size larger than it is for all intents and purposes. It is naturally proficient with these armor spikes, further, the Half Cadaver-Collector Golem is considered a quadruped for carrying capacities. Caltrop- This spiky material is constantly falling apart, as such any square moved through by a Half Caltrop Golem is left covered in caltropsCalzone-Carver-Chain-Chocolate-ConfusedClay- This material gives extra momentum to the Half Clay Golem. After it has engaged in at least one round of combat the Half Clay Golem can act as if it were under the effects of Haste. Activating this ability is a free-action, and lasts 1 round per HD and can be used once per day plus an extra use for every 4 HD the Half Clay Golem has. In addition, when the Half Clay Golem gains Damage Reduction at 2nd level, it gains DR Adamantine and Bludgeoning. Coral-Demon-flesh- This material is hewn from the bodies of the Flying terrors that hail from the Abyss. The Half Demon-Flesh Golem never suffers from falling damage and falls at a rate of 20 feet per round, even while unconscious its grafted wings snap open slowing its fall. Upon reaching 5 HD it gains the ability to glide 20 feet in any direction for every 10 feet it falls, its maneuverability is poor. Even if its maneuverability is improved to perfect, it cannot hover while gliding. Further the Half Demon Flesh Golem gains Darkvision 60 feet, this Darkvision works even in magical darkness. Dragon-flesh- This material is exceptionally sensible to vibrations. The Half Dragon-flesh Golem gains Blindsense with a range of 20 feet plus an extra 5 feet for every HD it has, further the Half Dragon-flesh golem gains a racial bonus on jump checks equal to its HD. Fang-Fewmet-Flesh-Force- This material is naturally enigmatic, The Half Force Golem gains a deflection bonus to armor class equal to its Wisdom modifier, further it gains a bonus on bull-rush checks (including opposed strength checks that are part of bull-rush checks) equal to its HD. This material was deftly put in motion by the forces of Law itself, adamantine, Mithral, Silver and Marble make up gears, cogs, sprockets, and whirligigs that twist and turn within its complicated construction. The Half Gear Golem finds itself functioning at maximum efficiency, requiring half as much sleep or meditation each night, even to prepare spells, half as much food/water, and half as much air as other creatures (It may hold its breath twice as long as it could before.) Further it gains a +2 bonus to Dexterity. If the Half Gear Golem becomes a construct through the danger, this clockwork efficiency goes to its mind, granting it a +2 bonus to Wisdom. Further, the Half Gear Golem may make repairs on other Constructs without a craft check or tools, it effectively gains access to any Repair spell of equal level or lower to half its HD, this ability is usable a number of times per day equal to its wisdom modifier. Hangman- This material has impressive self-preservation properties but requires constant maintenance. The subject gains fast healing equal to half its HD. Further the Half Hangman Golem gains a racial bonus to Climb, Use Rope, Profession (Sailor) and Profession (Hangman) checks equal to half its HD. However every time the Half Hangman Golem takes slashing or fire damage it must make a Fort save DC (10+ damage dealt) or it takes a -1 penalty to Dexterity. Further damage taken increases this penalty by an extra -1 to Dexterity for every failed save. It takes 1 minute of interrupted work with proper tools (cost 50 GP, not expended by this) and a successfully profession or craft check the appropriate type with DC (18) to remove each point of this Dexterity penalty. The Half Hangman Golem can repair itself but it takes double time. There's no penalty for failing these repair checks. A repair spell of any level instantly recovers an equal amount of this Dexterity penalty to the Hp damage it recovers. Hellfire- This material is wrought from the very fires of the hells, The Half Hellfire Golem's Dexterity improves by an extra +2 and its Natural armor increases to equal its constitution modifier. Any creature that damages the Half hellfire Golem suffers 1d4 fire damage per 4 HD the Half Hellfire Golem has. This material is often made from clay and the blood of the very person who is to receive the Limb. A Half Homunculus Golem never fails their The Danger will save unless the participant wills it do so, further the Homunculus limb has almost a secondary awareness to it, granting the subject a +2 bonus to Dexterity. Ice- This material is mined from the eternal mountain that holds ancient evils deep within its ice. The Half Ice Golem's Strength improves by an extra +2 and its Natural armor increases to equal its constitution modifier. Any creature that damages with a melee attack the Half Ice Golem suffers 1d4 cold backlash damage per 4 HD the Half Ice Golem has. Inevitable- This material is the flesh of Law itself, steel, ivory, brass and marble stolen from those who exist to maintain Order. The sheer force of Order and Law override any auras the Half Inevitable Golem would normally project. Any divination power that reveals alignment reveals only Lawful about the Half Inevitable Golem. All spells and effects that affect creatures based on alignment treat the Half Inevitable Golem as if it were Lawful or its own alignment, whichever would be better for the Half Inevitable Golem. The natural abortion of deceit runs hot within the inevitable limb, causing a tangible pain in the subject that assists with dealing with such trickery. The Half Inevitable Golem receives a racial bonus on all checks that it makes opposed by a bluff check equal to 1/2 its HD. Inquisition- This material is exceptionally cruel, and capable of silencing the cries of its opponents. Once per day per 2 HD the Half Inquisition Golem has the Half Inquisition Golem may use SilenceIron-Junk- A Half Junk Golem is immune to spells that normally effect metals or other specific materials, as that that their materials are not depended on any specific make-up, further the Half Junk Golem suffers half damage from any spell that directly damages constructs or objects. Further the Half Junk Golem may scavenge through refuse and trash in order to find appropriate materials to repair its body. A Half Junk Golem that spends 4 hours digging through a large collection of refuse, trash, garbage, or junk of mixed useless materials may recover Hp as living creature that has rested for 8 full hours. It requires 1 pound of mixed junk for every 1 hp restored in this manner. Juggernaut-Magmacore- This material is a mix of metal, stone, and molten earth, and is particularly difficult to contain, as such any square moved through by a Half Magmacore Golem is left covered in molten earth. These squares of Molten earth are considered difficult terrain, and slow land movement speeds as if it were two squares. Further any creature entering or standing in a square of molten earth suffers 1d4 points of fire damage per 4 HD the Half Magmacore Golem has. These squares of molten earth dissolve and cool three rounds after forming, and do not effect the Half Magmacore Golem. Further the Half Magmacore Golem gains a bonus to natural armor class equal to its full constitution modifier. Mindstrike-Mud-Mithral- This material is uncannily light and durable. After it has engaged at least in one round of combat the Half Mithral Golem can act as if it were under the effects of haste. Activating this ability is a free-action, and lasts 1 round per HD and can be used once per day plus an extra use for every 4 HD the half Mithral Golem has. 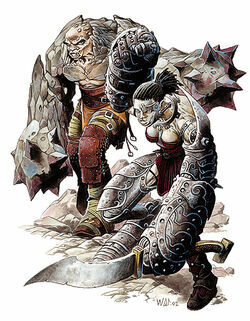 In addition the Half Mithral Golem gains a +2 bonus to Dexterity, and all of its base speeds increase by 10 feet. I know of the Ettin that has three heads. Is that some obscure giant with three brains or a joke I didn't get? I'd guess that's a reference to the multi-headed template from Savage Species. Skills:2+int modifier per level, quadruple at firt level, No class skills. * Not at risk of death from massive damage, but when reduced to 0 hit points or less, it is immediately destroyed. * Undead do not breathe, eat, or sleep. The NightWalker is a medium sized undead with two natural slam attacks dealing 1d6+Str modifier damage each and base speed 40 feet. The NightWalker takes no penalty for attacking with both claws at the same time. Any class levels the NightWalker takes have their HD increased to d12. In addition, a NightWalker gains a Natural armor bonus equal to it's Charisma modifier. Daylight Aversion: If exposed to natural daylight (not merely a daylight spell), a NightWalker take a -4 penalty on all attack rolls, saving throws, and skill checks. The nightwalker can avoid this penalty by wearing a cloak or some other sort of heavy cloaking. In return, a Nightwalker gains +1 to attack rollls, saving throws and skill checks while in an area of darkness. This bonus increases by 1 for every 5 HD of the Nightwalker. Chilling Blow:The NightWalker may temporarily paralyze parts of an oponent's body, or force them to drop what they're carrying Whenever the NightShade hits an opponent with one of their slam attacks, they may choose to deal half damage and prevent the oponent from using one of his natural weapons for 1 round (NightWalker's choice), or perform a disarm atempt as a free action. Darkness Skin:At 2nd level, the NightWalker gains DR/Silver and a bonus on Hide and Move Silently checks equal to half their HD, plus resistance to cold equal to their full HD. Ability Increase: The Nightwalker gains a permanent +1 to Str at all levels and +1 to Cha at levels 4, 8, 11, 13, 15, 16, for a total of +14 Str and +6 Cha at level 16. Creeping shadow:At third level, the Nightwalker can begin to manipulate light and shadow, gaining the ability to use Deeper Darkness, Invisibility and See Invisibility as SLAs, each 1/day per HD. The Deeper Darkness SLA of the NightWalker counts as having a level equal to half the NightWalker's HD for purposes of countering/dispelling light spells. Evil Gaze:Stalking Shadow:At 5th level the NightWalker can use Contagion, Haste and Dispel Magic as SLAs, each 1/day for each 2HD. Save DCs are 10+1/2 HD+Cha modifier. At 10 HD the NightWalker's contagion can affect even creatures immune to disease, but they gain a +5 bonus on their Fortitude saves to resist it. At 11HD the Dispel Magic upgrades to Greater Dispel Magic. Growth: At 6th and 12th level of this class the NightWalker grows one size category. If all levels of the NightWalker were taken, it grows one more size category upon reaching 18 HD. Sudden Darkness: At 6th level, the Nightwalker can use Deeper Darkness as an immediate action. Consuming Shadow: At 7th level the NightWalker can use Unholy Blight 1/day per 3 HD, except that it affects creatures of all alignments except evil undead like they were good creatures, and it has no Maximum damage limit. Against actual creatures of good alignment, it counts them as good outsiders. Against actual good outsiders, it deals 1d8 damage per caster level. Summon Darkness:at 8th level the NightWalker can summon forth 1d2 shadows 1/hour as a standard action. They arrive instantly and serve for 1 minute per HD. Undead summoned this way can never spawn other undead. At 10 HD the NightWalker may summon 1d4 shadows or 1d2 Wraiths instead. At 12 HD the nightwalker may summon 1d6 shadows, 1d4 Wraiths or 1d2 Greater shadows instead. At 16 HD the summoned Undead can deal half ability damage/drain to oponents normally immune to it. Overwhelming shadow:At 9th level the NightWalker can use Cone of Cold as a SLA 1/day for every 4 HD it has, except that it has no Maximum damage, and oponents are entangled for 1 round per HD if they fail their saves, or for 1 round if they suceed on their saves. Nightmare: at 9th level the NightWalker can fly with poor maneuverability at half its land speed, and gains SR equal to 11+HD. Desecrating Aura:Master shadow:At 11th level the NightWalker can use Confusion and Hold Monster as SLAs 1/day for every 4 HD it has. Save DCs are 10+1/2 HD+Cha modifier. Darkness Fist: at 12th level, whenever the NightWalker hits an opponent with its slam attack, it may spend one of his Deeper Darkness as a free action on that opponent to cover his eyes with pitch black, making it become blind for 10 min per HD. A reflex save with DC 10+1/2HD+Str mod prevents the blindness. Crushing shadow:At 13th level the NightWalker can use Planeshift and Shadow Walk as SLAs 1/day for every 5 HD. Save DCs are 10+1/2HD+Cha mod. Crush:At 14th level a NightWalker can destroy any weapon or item at least one size category smaller than itself (even magic ones, but not artifacts) by picking it up and crushing it between its hands. The nightwalker must make a successful disarm attempt to grab an item held by an opponent. The item is entitled to a DC 10+1/2HD+Str modifier Fortitude save to resist destruction. If it fails, it's crushed into fine diamond powder worth the same amount as the destroyed item. This also allows the NightWalker's to automatically destroy lasting magical effects (even ones such as a Wall of Force) by hitting them with his Slam attack and spending one of his Greater Dispel Magic uses. Unstopable shadow: At 15h level the NightWalker can use Finger of Death as a SLA 1/day for every 6 HD it has, except that it also affects creatures immune to Death effects, including other undead, which are reduced to dust. Those creatures gain +5 on their saves to resist this however. Save DC is 10+1/2 HD+Cha mod. Eclipse:At 16th level, 1/day as a standard action, the NightWalker can block the very Sun (or whatever main source of light illuminates the current plane it is on) on top of smoothering all other light sources by covering them with pitch black. Mundane fires, lanterns and the like grow dark (but aren't actually put out) and even magic sources of of light are suppressed unless they're from artifacts. This means the NightWalker and other creatures that are normally vulnerable to daylight take no penalty for the duration of the eclipse, wich lasts 10 minutes per HD. Spells with the light descriptor of 8th level or lower are automatically countered/dispelled on a radius of 1 mile per HD centered on the NightWalker during the duration of the Eclipse. Finally, during the Eclipse, all the bonus from the Desecrating Aura becomes equal to the Nightwalker's HD/2, its area increases to a radius of 5 feet per HD, and the penalty to turning increases to -10. In Soviet Russia, the Darkness attacks you! Ahem, the Nightwalker is a shaddow-focused undead, altough it itself is corporeal, and instead of ability damage/drain it focuses on breaking stuff up. At first level you've got a disarmer/sunderer that's also usefull against weaponless oponents. As the NightWalker grows it unlocks DR, some skill bonuses, a wide variety of SLAs focusing on stealth and debuffing/disabling, size increases, minions, flight, SR and some other goodies, making for a quite versatile monster. I buffed some of the more limited SLAs to give it some extra punch. The signature ability, Crush can also be used to break down Walls of Force and the like, and I gave it Shaddow walk because it seems to fit. As a capstone you can literally cover the land in darkness for some hours, allowing you and your minions to spread terror unchecked by pesky daylight. If you want to play a walking solid shaddow that smoothers all hope wherever it goes, the NightWalker is for you.